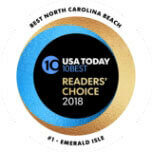 If you’re traveling by plane, the closest airports to Emerald Isle are the Albert J. Ellis Airport, located in Jacksonville, and the Coastal Carolina Regional Airport, located in New Bern. Both are a little less than an hour away and each has rental car agencies at the airport. The Albert J. Ellis Airport services flights from Charlotte or Atlanta, while the Coastal Carolina Regional Airport accepts flights from Raleigh/Durham and Greensboro. If you’re traveling from the Raleigh/Durham area: 40 East, Hwy 24 East, Hwy 58 South over the Emerald Isle Bridge, Turn right at the first light onto Coast Guard Road, Turn left into Spinnaker’s Reach community, Office is first "home” on the left. It’s a little over two hours. If you’re traveling from the Washington D.C. Metro Area: 95 South, US 70 BYP- 70E, Hwy 58 South over the Emerald Isle Bridge, Turn right at the first light onto Coast Guard Road, Turn left into Spinnaker’s Reach community, Office is first "home” on the left. The journey takes about six hours. If you’re traveling from the Charlotte area: Hwy 74 E, Hwy 17 N, Hwy 24 E, Hwy 58 South over the Emerald Isle Bridge, Turn right at the first light onto Coast Guard Road, Turn left into Spinnaker’s Reach community, the office is first "home” on the left. This trip will take about five hours. Our street address is 9918 M.B. Davis Court, Emerald Isle, NC 28594. If you have any questions please feel free to contact us today!